Brendan Rodgers is understood to be high on Leicester City’s shopping list - if they choose to get rid of manager Claude Puel. The Frenchman is struggling, with the Foxes 12th in the table having lost their last two matches. Puel is the favourite with some bookmakers to be the next EPL manager to get his jotters. 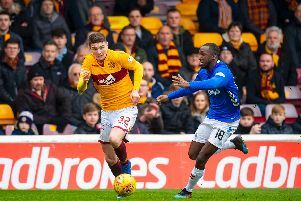 Celtic face an anxious wait to learn the extent of Odsonne Edouard’s injury, after the French striker was forced off during the 3-0 Ladbrokes Premiership win over Motherwell on Wednesday night. The Hoops face Dundee on Saturday and if Edouard is ruled out, Brendan Rodgers will have no senior strikers available to him, with Leigh Griffiths sidelined as he deals with personal issues. After Dundee, Celtic face trips to Pittodrie and Ibrox, and Rodgers is hopeful of having the former Paris Saint-Germain youngster available for those matches. He said: “[Odsonne] felt a tightness around his abductor so we’ll assess that in the next 24 hours. It’s where we’re at and there’s not a great deal we can do. Callum McGregor has signed a new deal with Celtic, keeping him at the club until the summer of 2023. The midfielder, who progressed through the Celtic Youth Academy, made his 200th appearance in the 2-0 loss to Hibs at the weekend. He made his senior debut in 2014, scoring the only goal as the Hoops defeated KR Reykjavik of Iceland in a UEFA Champions League qualifier.